In The Hollies Style is the second studio album by British beat group The Hollies, released on the Parlophone label in November 1964. The album was later released in Canada by Capitol Records on 4 October 1965 with a different track listing. As a result of poor sales of stereo copies of the band's debut album in the UK, In the Hollies Style was only available there in mono while stereo mixes were shipped to other markets. The stereo mix was finally released in the UK and retitled The Vintage Hollies in 1967. In 1997, British EMI put both mono and stereo versions of this album onto a single CD. 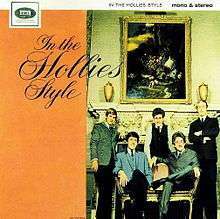 Like the album's predecessor, Stay with The Hollies, In The Hollies Style was recorded at EMI Studios on Abbey Road in London, UK – which was later re-titled after the name of the street – and was produced by Ron Richards – who worked for other Abbey Road artists and later founded Associated Independent Recording with George Martin and John Burgess. Recording for the album commenced on 13 April 1964 when the band recorded the tracks "Time for Love" and "Don't You Know". Recording continued on the 27th of that month where "You'll Be Mine", "It's in Her Kiss", "Come on Home", "Too Much Monkey Business" and "I Thought of You Last Night" were put to tape. Three more songs, the eventual B-side "Come on Back", "Set Me Free" and "Please Don't Feel Too Bad" were recorded on 30 June. The group then didn't enter the studio for almost two months, returning 16 August to record "What Kind of Boy" and to attempt the eventual single, "We're Through". Not satisfied with the arrangement from this session, they re-recorded "We're Through" on 25 August, at which time the final two songs recorded for the album, "To You My Love" and the opening medley "Nitty Gritty/Something's Got a Hold on Me", were also recorded. A similarity between this album and its predecessor is the inclusion of many rhythm and blues songs by American writers and performers, such as Chuck Berry and Etta James. However, unlike its predecessor, In The Hollies Style also had multiple songs written by members of the band. In fact, 7 of the 12 songs on the album were written by Allan Clarke, Tony Hicks, and Graham Nash and were credited to the members under the pseudonym "L. Ransford". Clarke, Hicks, and Nash continued to use the pseudonym until the For Certain Because album at the end of 1966, when the group's compositions started to become hits. All songs written by Allan Clarke, Tony Hicks and Graham Nash (credited to "L. Ransford"), except where noted. Although the Hollies had become major stars in the UK, neither their US nor their Canadian labels chose to release this album. Finally, after the release of their third UK album, Hollies, Capitol Canada chose to release this album in an altered version on 4 October 1965 and not to release Hollies. The Canadian version only includes five of the songs on the UK version, while also making room for three of the band's UK non-album hits ("We're Through", "Yes I Will" and "I'm Alive"), two B-sides ("You Know He Did" and "Come on Back", which was later re-written as "Stop Stop Stop"), one song from Hollies ("Mickey's Monkey") and one other song recorded for but not included on Hollies ("Honey and Wine"). In total, the Canadian version included 6 songs written by Clarke-Hicks-Nash and credited to L. Ransford, only one less song than the UK version, and 10 different original songs were included on the two versions of the album. 1 2 "Album Listing by Release Date" (PHP). The Hollies. Retrieved 25 April 2011. ↑ "The 6000 Series of 33⅓ RPM Vinyl Discs". Capitol 6000. Canada: Piers Alexander Hemmingsen. Retrieved 25 April 2011. ↑ The Clarke, Hicks & Nash Years: The Complete Hollies – April 1963 – October 1968 (CD). The Hollies. EMI Records. 2011. 50999096242 2 1. 1 2 Pidgeon, John (1990). "Hits in Harmony". The Marshall Cavendish Illustrated History of Popular Music. Vol. 6 (Reference ed.). Singapore: Marshall Cavendish. pp. 605, 606. ISBN 1-85435-021-8.